All control modules are based on the XCS2000 system and, thus, are structurally similar. The picture on the right shows an abstraction of that structure which illustrates the basic components. The main processor is the digital signal processor (DSP). It is connected to the programmable logic device (FPGA), to memory and to peripherals like communication channels. The DSP computes the control algorithm and handles additional I/O, finite state machines and communication. 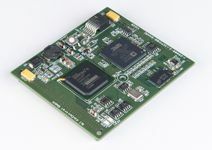 The FPGA is connected mainly to analog and digital I/O but may also be connected to communication facilities. The FPGA realizes the real-time critical handling of e.g. switching signals or signal acquisition. There are two types of modules available: Processor modules are prefixed by XCP and FPGA-only modules are prefixed by XCF. Historically and out of conviction, we rely on the power and performance of Analog Devices DSPs. The processor modules utilize different DSPs in order to cover different levels of performance. Likewise, the programmable logic devices of our choice are Xilinx devices of different families and densities as needed by the application. All modules are produced for the industrial temperature range (-40°C - 85°C). The XCP2100 was the first module and reflects the above mentioned structure best: All components are present. The module covers all aspects of an embedded control platform for power electronics. 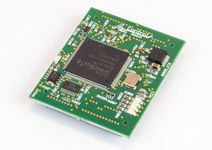 The XCP500 is a scaled-down module made for communication purposes alone. 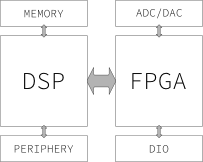 No FPGA or analog circuitry is present on the board and digital I/O are directly connected to the DSP. Through-hole connections allow direct population of the controller on the carrier board. In order to support highest performance requirements, the XCP3100 has been developed based on the Analog Devices' ADSP-21469 floating-point DSP. Designed without an analog input path, the DSP is paired with an FPGA of Xilinx' Spartan6 series by memory bus and link port for concurrent fastest, DMA-based data transfer and random access. The module offers approx. 200 digital I/O. If no processor but only programmable logic is required, the XCF3000 offers a cost-effective way of realizing FPGA-based control. Based on Xilinx' Spartan6 series, the module offers advanced FPGA features such as LUT6 and PLL/DCMs combined with a four-channel 14 bit 1.2 MSPS analog to digital converter, all necessary supply circuitry and a serial flash on less size than a credit card. 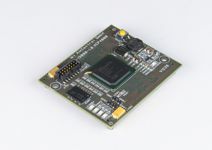 High-performance FPGA-based control can be realized with the XCF4000 module. Based on Xilinx' Spartan6 series, the module offers advanced FPGA features such as LUT6, PLL/DCMs and a built-in memory controller core. Additionally, the module comes with local DDR2 memory, flash, EEPROM and eight analog input channels.